Water is something most Canadians take for granted and it's no wonder. Per capita, our country has the world's third-largest freshwater reserves, but yet in many Indigenous communities, water can be difficult to access, at-risk because of unreliable treatment systems, or contaminated. Water is something most Canadians take for granted. We have so much of it, it's no wonder. Per capita, our country has the world's third-largest freshwater reserves, but yet in many Indigenous communities, water can be difficult to access, at-risk because of unreliable treatment systems, or contaminated. That's the case in Delaware First Nation, an Indigenous community of about 500 people an hour southwest of London, Ont., a place where fishing was everything 60 years ago. "I come from a community where we used to fish," Gordon Peters said. "Every year we had a social event that lasted maybe two to three weeks and we all fished." "Families came and everybody came, but we don't do that anymore because the fish is contaminated." Now 69, Peters, who is a local band councillor and a regional deputy grand chief, said the water in Delaware First Nation is so ravaged by industrial filth, most people are only allowed to eat one fish a month; while small children and pregnant women are allowed none at all. People don't even trust the groundwater, Peters said. 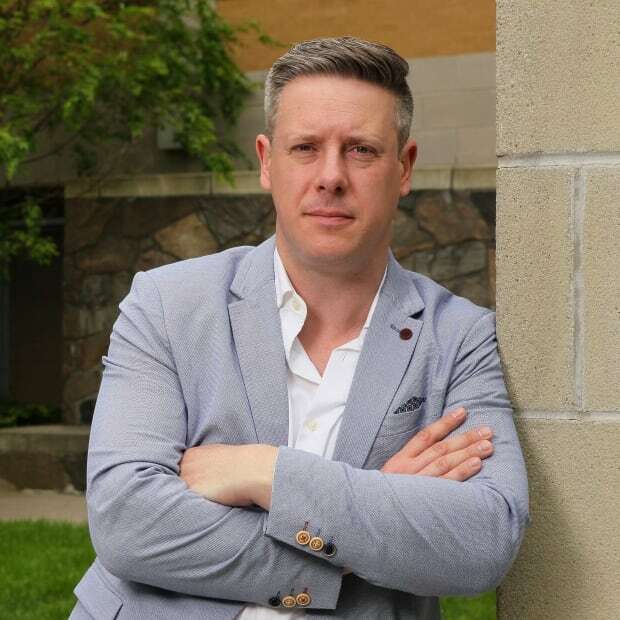 His community believes their water has been tainted from the legacy of Ontario's oil boom and even though its treated and runs cool and clear from the taps of peoples' homes, it goes unused because it's laced with fear. "People don't even trust it, they go to the next town over and buy big bulk water," he said. 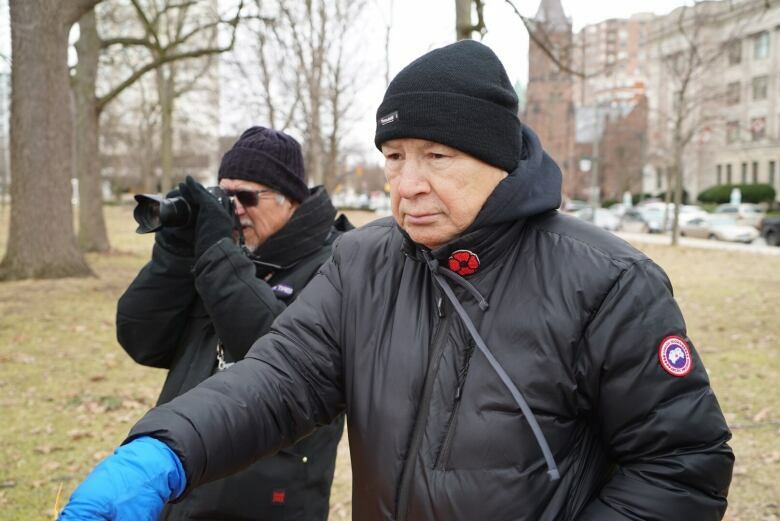 It's why Peters has made the trip to London's Victoria Park, where a number of high-ranking Indigenous leaders have gathered to pay tribute to a woman who fought for clean water. "In our world, the women are responsible for the water," Peters said. "Josephine Mandamin had a huge impact on a lot of people." 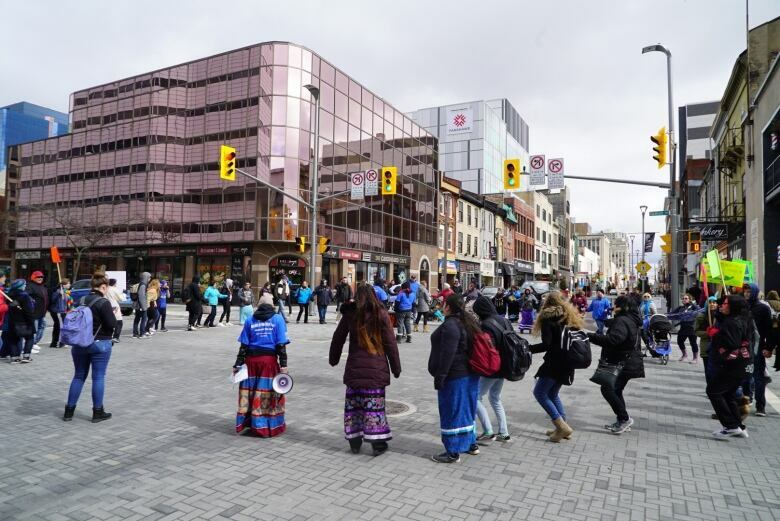 That impact was evident in the London park on World Water Day, where about 100 gathered to pay tribute to the Anishinaabe woman, who walked around the rim of the Great Lakes and the St. Lawrence River, which together, make up almost half of the circumference of the Earth. 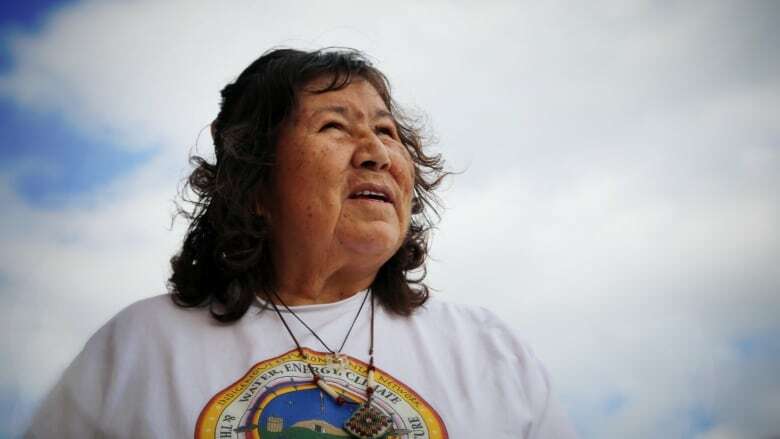 People told stories about how she walked so much, she wore out three knees, 11 pairs of shoes and galvanized entire communities to stand up for their water as a human right. "Josephine was like a mother and a grandmother to everyone who wants to protect the water," said Mary Duckworth. Duckworth is the chief of Caldwell First Nation near Leamington, Ont. As Canada's southernmost Indigenous community, its traditional territory stretches from Point Pelee to Pelee Island. "We are from the water. Our traditional name is 'the people from the water," she said. "Not having toxins dumped into our water is really important to me. My relationship runs deep." What worries Duckworth when it comes to water are nitrates, a common byproduct from manure spreading and fertilizer use in agriculture. While nitrate levels in water is monitored by the province, the chemical has been linked to a number of health risks. "This is 2019, farms shouldn't be dumping things in the lake." 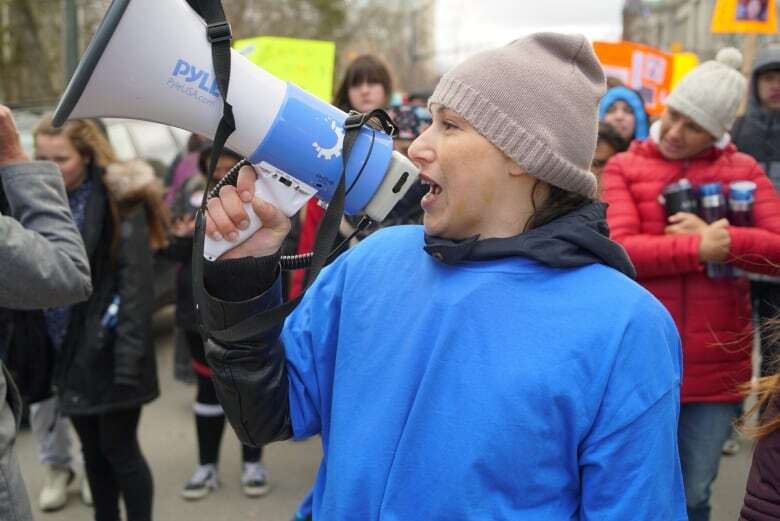 To show they mean business, the 100 or so demonstrators marched from Victoria Park in downtown London to Harris Park on the rim of the Thames. On their way, they waved placards, chanted slogans and stopped traffic at major intersections to get their message across: if we don't have clean water, we won't survive. "Water is life," said Amanda Doxtator . "It's the blood of our Earth and it's the only thing that keeps everything alive." Doxtator, who delivered the opening prayer at the Water Day ceremony honouring Josephine Mandamin, is from Oneida Nation of the Thames, about a half hour's drive south of London. The Indigenous community of about 2,000 people has its own share of water troubles. Toronto's landfill site, Green Lane Environmental, is on the community's doorstep and its putrid aroma can blanket Oneida when the conditions are just right. Many believe the dump has contaminated not just the air, but their water as well. In Ontario, the government says it's trying to fix the problem. In March, the province announced $15 million to end drinking water advisories for 91 First Nations communities in the province. There are 62 Indigenous communities that don't have potable water. Many of them are under boil water advisories and at least one has been under such an advisory for more than two decades. At least four can't consume their water under any circumstances. Doxtator believes people need to do more and that includes realizing what they're doing to the planet. She characterizes her relationship with water as mother-daughter and says her "mum" isn't well. "She's very sick. She's not the way she's supposed to be. Our weather is getting more fierce," she said. "There's more earthquakes, more tsunamis, more tornadoes, that's her sign to us that we need to smarten up."